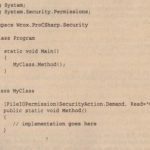 POSSiblythe most important class in the Sys tern. Globalization namespace is Cul turelnfo. Cul turelnfo represents a culture and defines calendars, formatting of numbers and dates, and sorting strings used with the culture. The class Regionlnfo represents regional settings (such as the currency) and shows whether the region is using the metric system. 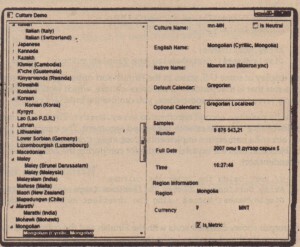 Some regions can use multiple languages. One example is the region of Spain, which has Basque (eu-ES),Catalan (ca-ES),Spanish (es-ES),and Galician (gl-ES)cultures. Similar to one region having multiple languages, one language can be spoken in different regions; for example, Spanish is spoken in Mexico, Spain, Guatemala, Argentina, and Peru, to name only a few countries. A specific culture is associated with a real, existing culture defined with RFC 1766,as you saw in the preceding section. A specific culture cap)be mapped to a neutral culture. For example, de is the neutral culture of the specific cultures de-AT, de-DE, de-CH, and others. 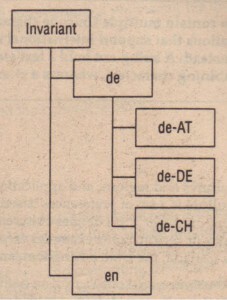 de is shorthand for the German language; AT,DE, and CH are shorthand for the countries Austria, Germany, and Switzerland, respectively. The invariant culture is independent of a real culture. When storing formatted numbers or dates in files, or sending them across a network to a server, using a culture that is independent of any user settings is the best option. Figure 21-2 shows how the culture types relate to each other. When you set cultures, you need to differentiate between a culture for the user interface and a tun! for the number and date formats. Cultures are associated with a thread, and with these two culture rpes, two culture settings can be applied to a thread. The Thread class has the properties CurrentC1.! : =..=e and CurrentUICul ture. 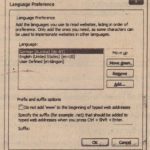 The property CurrentCul ture is for setting the culture that is used n form’!1ting and sort options, whereas the property CurrentUICul ture is used for the language of the user interface. 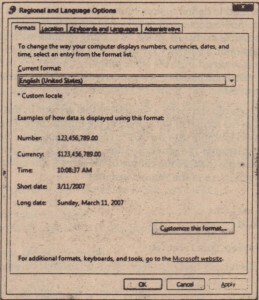 Users can change the default setting of the CurrentCul ture by using the Regional and Language options in the Windows Control Panel (see Figure 21-3). With this configuration, it is also possible to change the default number, the time, and the date format for the culture. The CurrentUICul ture d6es not depend on this configuration. The CurrentUICul ture setting depends on the language of the operating system. There is one exception, though: If a multi-language user interface (MUI) is installed with Windows Vista or Windows XP,it is possible to change the language.pf the user interface with the regional configuration, and this influences the property CurrentUICulture. ToStrillg () without arguments returns a string without format options. You can also pass a string and a class that implements IFormatProvider. 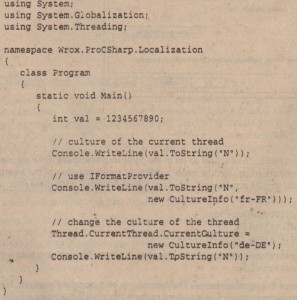 The string specifies the format of the representation. The format can be a standard numeric formatting string or a picture numeric formatting string. 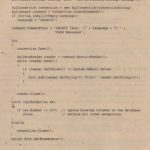 For standard numeric formatting, strings are predefined, where Cspecifies the currency notation, Dcreates a decimal output, E creates scientific output, F creates fixed-point output, Gcreates general output, Ncreates number output, and Xcreates hexadecimal output. With a picture numeric fonnat string, it is possible to specify the number of digits, section and group separators, percent notation, and so on. The picture numeric format string 111111 , II * * means two three-digit blocks separated by a group separator. . The IFormatProvider interface is implemented by the Number FormatInfo, Date TimeFormatInfo, and CultureInfo classes. 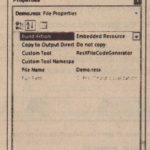 This interface defines a single method, GetFormat (), that returns a format object. Number Forrnat lnfo can be used to define custom formats for numbers. With the default constructor of Number Forrnat lnfo, a culture-independent or invariant object is created. Using the properties of Number Format lnfo, it is possible to change all the formatting options, such as a positive sign, a percent symbol, a number group separator, a currency symbol, and a lot more. 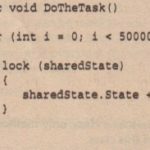 A read-only culture-independentNumberForrnatlnfo object is returned from the static property Invariantlnfo. ANumberForrnatlnfo object in which the format values are based on the CuI turelnfo of the current thread is returned from the static property Currentlnfo. The output is shown here. Youcan compare the outputs with the previously’ listed differences for U.S.
Cul turelnfo object at a later time from within the tree. 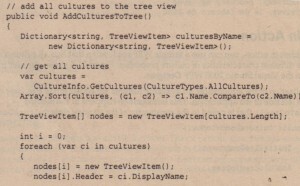 Where the Tree View Item is added inside the tree depends on the culture type. If the culture does not have a parent culture, it is added to the root nodes of the tree. To find parent cultures, all cultures are remembered inside a dictionary. Recall Chapter 10, “Collections,” for more information about dictionaries and Chapter 7, “Delegates and Events” for Lambda expressions. 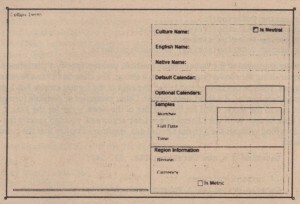 Then you get the calendar information about the culture. 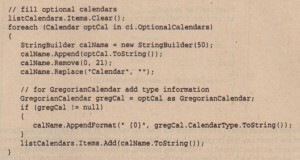 The Calendar property of the Culturelnfo class returns the default Calendar object for the specific culture. Because the Calendar class doesn’t have a property to tell its name, you use the ToString () method of the base class to get the name of the class, and removethe namespace of this string to be displayed in the text field textCalendar. When you startthe application,you can s,· allavailableculturesin the treeview, and selectinga culture liststhe cult.uralcharacteristicsa,s shown in Figure 21-5. 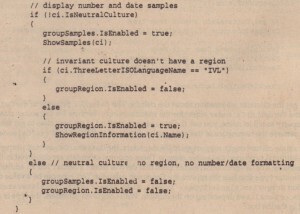 The program output shows different sorts with the Finnish and the culture-independent cultures: Virginia goes before Washington when using the invariant sort order and vice versa using Finnish. Sorted using the Finnish culture Alabama – Alaska – Arizona – Hawaii – Kansas – Kentucky – Louisiana – Missouri – Texas – Utah – Washington – Virginia – Wisconsin – Wyoming – Sorted using the invariant culture Alabama – Alaska – Arizona – Hawaii – Kansas – Kentucky – Louisiana – Missouri – Texas – Utah – Virginia – Washington – Wyoming. In addition to a locale-dependent formatting and measurement system, text and pictures may differ depending on the culture. This is where resources come into play.